CITY OF MALOLOS, Bulacan — Incumbent local officials and other political aspirants in this province signed on Friday a peace covenant for honest, orderly and peaceful elections. The signing, a joint endeavor of the Commission on Elections (Comelec), Parish Pastoral Council for Responsible Voting (PPCRV),Bulacan Police Provincial Office and the Philippine Army’s 48th Infantry Battalion, was held at the Barasoain Church here. Before the activity, the candidates held a unity walk from Paseo del Congreso to Barasoain Church, followed by an interfaith prayer. 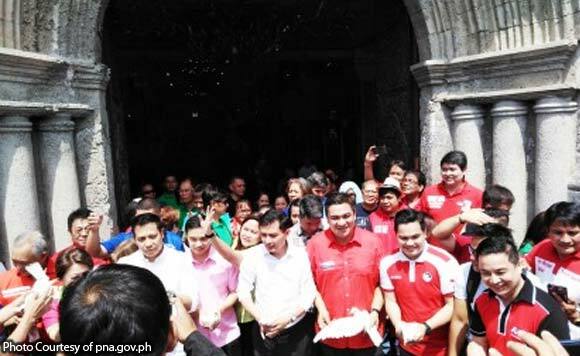 The participants were candidates from different political parties led by gubernatorial aspirants Malolos City Mayor Christian “Agila” D. Natividad (PDP-Laban); Vice Governor Daniel Fernando (NUP), and Ernest D. Balite (Independent); Gov. Wilhelmino-Sy-Alvarado and Board Member Anjo Mendoza for vice governor; and Rep. Jonathan Sy-Alvarado and his opponent, Sander Tantoco for Bulacan’s 1st District. Col. Chito Bersaluna, director of the Bulacan Police Provincial Office, said that as the local campaigning is going to start next week, “it is very important to maintain peace in our communities”. “We are conducting this activity because we want to have a peaceful and orderly election in May 2019,” he added. Lawyer Elmo T. Duque, assistant regional election director, said the presence of the candidates and other stakeholders in the activity showed their sincere commitment to peaceful elections. “The unity walk, interfaith prayer rally and peace covenant signing is an agreement for an honest and peaceful election this coming May,” Duque said. Provincial election supervisor Mona Ann T. Aldana Campos led the integrity pledge that encourages the aspiring candidates to support the conduct of honest, orderly, and peaceful elections or HOPE. Campos said the Comelec believes that the election is not only the work of one sector. “It needs other groups of people for us to attain our main objective,” she added. In attaining the objective, she said the active support and involvement of line agencies of the government such as the Philippine National Police, Armed Forces of the Philippines, Department of Education, PPCRV, other non-government organizations, government agencies, the candidates, and the electorate are needed.